The event, scheduled for noon to 6 p.m., is hosted by Food Truck Festivals of America. Advance sale tickets are $5, or $10 at the gate. VIP tickets ($20 advance; $25 at the gate) give ticketholders access to the food trucks from 11 a.m. to noon, before the event officially starts. Janet Prensky, a partner and public relations specialist with Aigner/Prensky Marketing Group, said in an email that more than 8,000 people attended the first Syracuse Food Truck & Craft Beer Festival at the fairgrounds last year, and that about 35 food trucks are taking part this year. Most are from the Syracuse-Central New York region, Rochester and the Finger Lakes. The trucks will offer a wide range of food: barbecue, grilled cheese, macaroni and cheese, Mediterranean cuisine, Tex-Mex fare and more, including ice cream and desserts. Participants familiar to Central New York food truck fans include Byblos, Birdsong Café, Café 119, Cruisin’ Cones, Lady Bug Lunch Box, Mo’s Pit Barbecue, Ponchito’s Chuck Wagon, Shattuck’s Paddy Wagon, the Salt City Food Truck, That’s What’s Up, the Chicken Bandit Food Truck and Eatery, Toss ’n’ Fire Wood-Fired Pizza, The Cremeria and others. Jim Rusaw, Cindy Baker and Dennis Souva (The Chicken Bandit team) celebrate their second consecutive win of "People's Choice-Best Food' at the Cortland Art & Wine Festival yesterday. On the right is Anne Cinemore, with the Cortland Cultural Council. Thanks, fans! Society Gurl tracks down The Chicken Bandit! Society Gurl's favorite: "Bandit Seasoned" chicken! 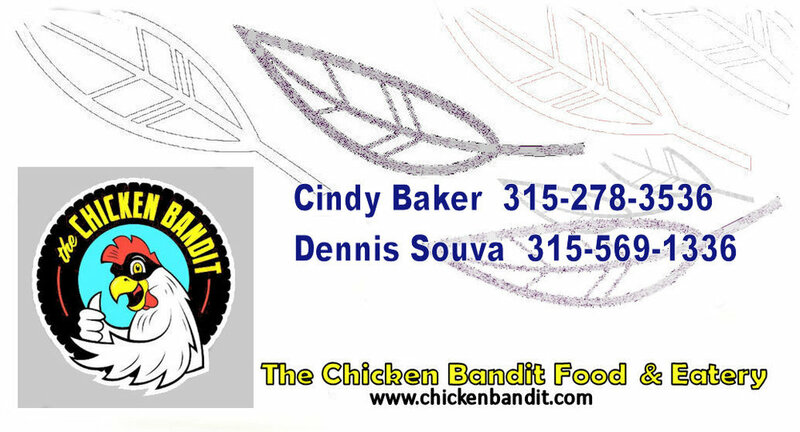 The Cerow family hired the Chicken bandit to provide after reception snacks for it's 200 guests on New Year's Eve. How cool is that!